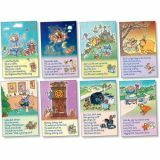 Colorful illustrations and whimsical animal characters offer a humorous view of eight Mother Goose classics, captivating students and drawing them into the rhythms and rhymes that help build foundational language skills. Posters are 11" x 17". 8 pieces. Help students learn numbers with early learning classroom décor. 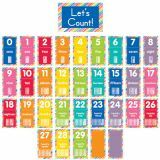 The 34-piece Just Teach Number Cards Bulletin Board Set provides a visual reference for students year-round. This set includes a header (11" x 17"), 31 number cards (5.6" x 11.2") and 2 blank cards (5.6" x 11.2") and can be used as a center activity for early learners.